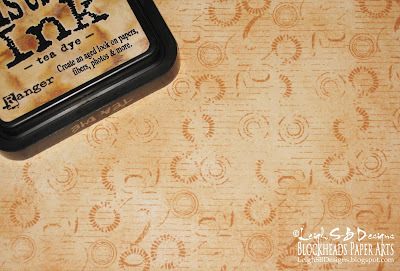 So why all the grungy card ideas...well Blockheads Paper Arts is going to be featuring their Grunge It Up stamp set in an upcoming newsletter and we've been coming up with lots of grungy goodness to inspire you. Now for a quick recap...here's a look at a group shot of all the grungy backgrounds I've made. Click on the pic to go to the tutorial for the blue backgrounds and each card for those tutorials. Here's the first 2 cards I made using those backgrounds. 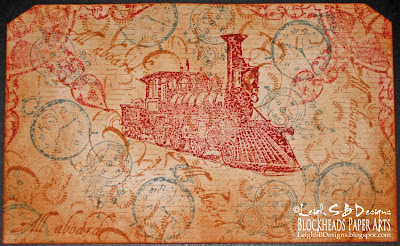 To create that awesome grungy background cardstock I used the following Blockheads exclusive stamp sets: Grunge It Up, Victorian Inventions and Vintage Railway. 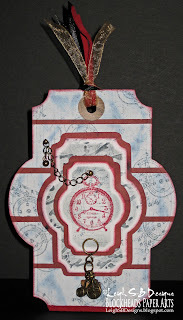 Distress Inks: Weathered Wood, Fired Brick and Tea Dye, Tim Holtz Idea-ology Paper Stash cardstock - Retro Grunge, white and black cardstock, Tim's Idea-ology Nostalgic Paper Tape, Tim's Foam Ink Applicator tool, white cardstock, mustard coloured brads, Black Pearl embellies, Greek Key Fiskars border punch, permanent adhesive tape, pop dots, small hole punch and a Happy Father's Day tag from CardMaker. 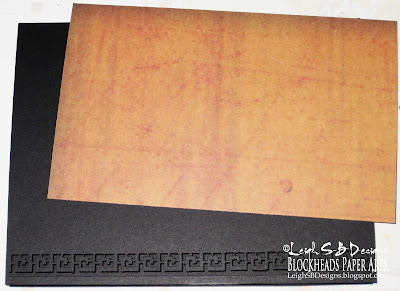 Apply Tea Dye Distress Ink all over a sheet of white cardstock. 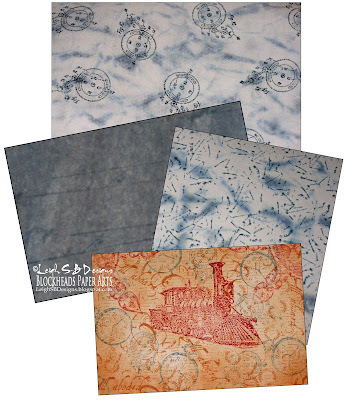 Stamp the collage-like grunge image multiple times to fill the sheet in Tea Dye ink. 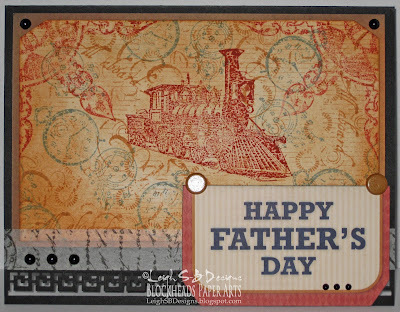 Also using the Tea Dye ink stamp the large twirly flourish grunge image and the All Aboard sentiment from the Vintage Railway set. 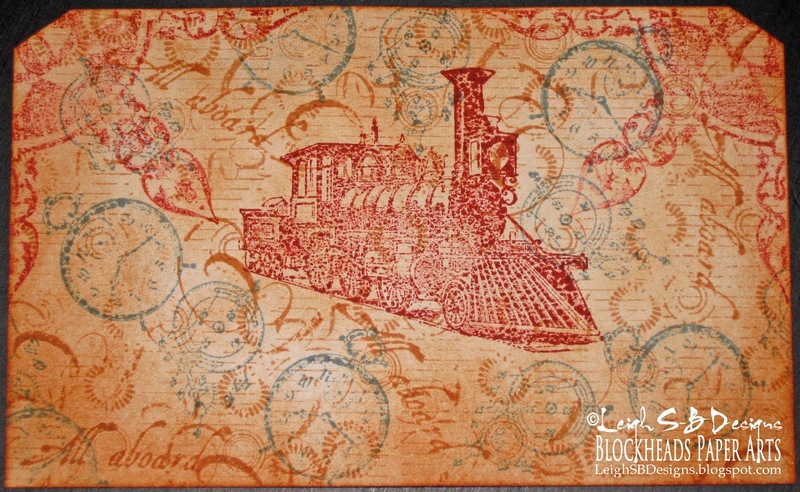 Randomly stamp the gears and clock images from the Victorian Invention set in Weathered Wood D ink. 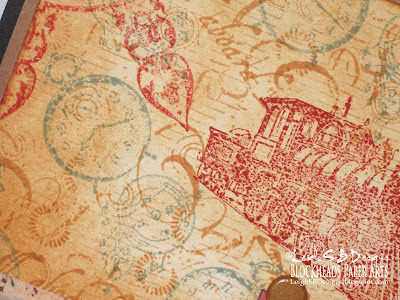 For more of a faded effect first press the freshly inked stamp on a scrap piece of paper to remove some ink and then stamp on the background cardstock. 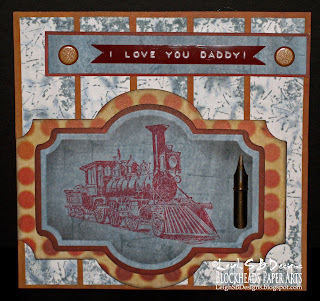 Do the same faded effect and stamp the large grunge corner image and the vintage train in Fired Brick Distress ink. 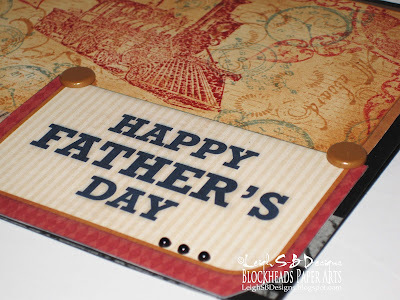 Cut the two top corners off to mirror the corners on the 'Happy Father's Day' tag and apply Tea Dye Distress ink to the edges of the cardstock to age and darken the background panel. 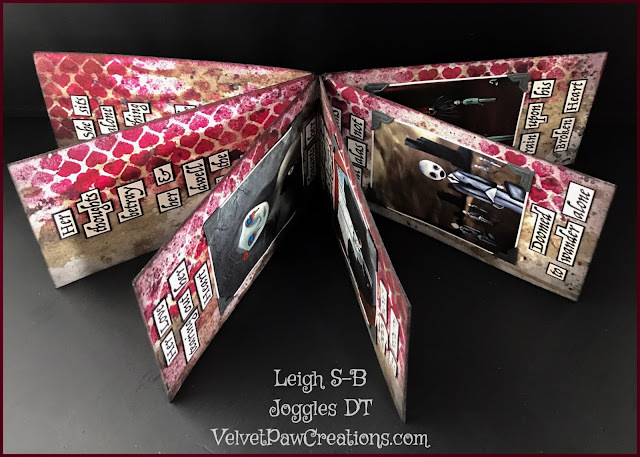 Cut a mat from Tim's Retro Grunge cardstock just slightly larger than the grunge collage panel and make a folded card from black cardstock slightly larger still. Punch the Greek Key border along the bottom edge of the card. 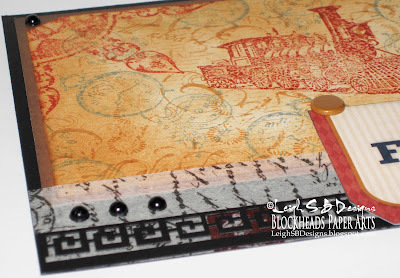 Adhere the grunge collage panel to the Retro Grunge cardstock and then to the black card with permanent adhesive tape. Add a strip of Tim's Nostalgic Paper Tape along the bottom edge just above the Greek Key border. 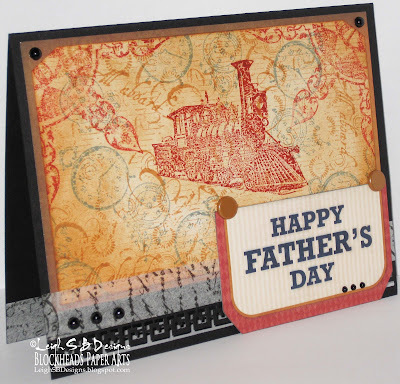 Apply Weathered Wood Distress Ink to the edges of the 'Happy Father's Day' tag and adhere it to the card with a dab of adhesive tape. Punch two tiny holes on the top edge and attach two mustard coloured brads. Add three self adhesive black pearls on the bottom left corner and one on each of the top corners and three smaller pearls on the tag too. Finish off the card by adding a strip of the paper tape to the inside of the card along the bottom edge so it can be seen through the punched border when the card is closed. 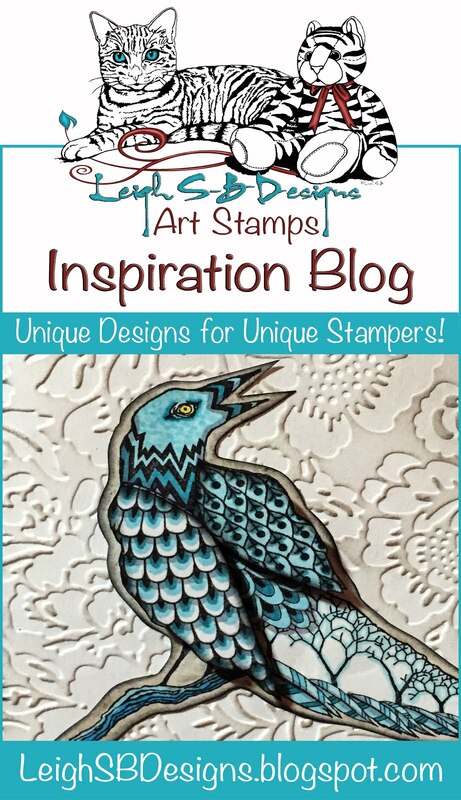 I really have had loads of fun creating with the Grunge It Up stamps and I hope you've enjoyed checking them out too! 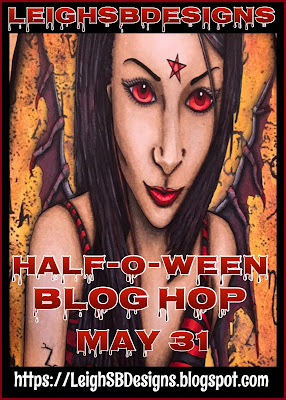 Here's some more links to a few of my other projects that also feature the Grunge It Up set. 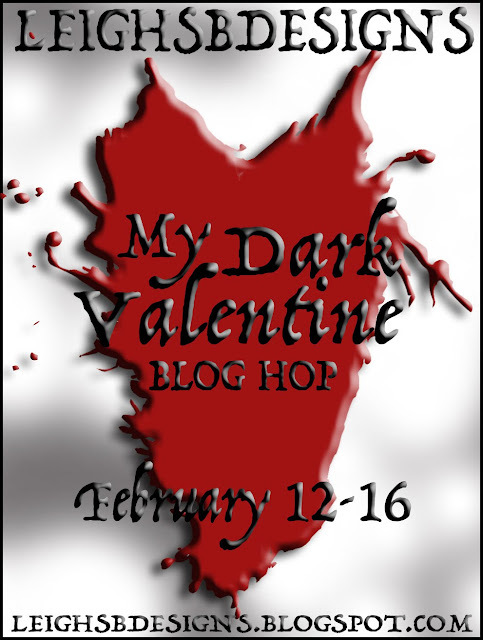 It truly is versatile and fun to have in your collection! Super card Leigh, I always srtuggle with male cards and I can see you've cracked it! 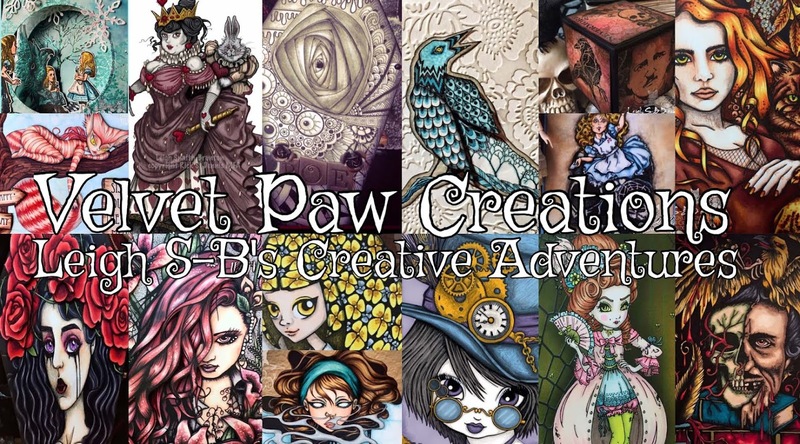 Fab cards and love your grunge papers, awesome use of techniques! 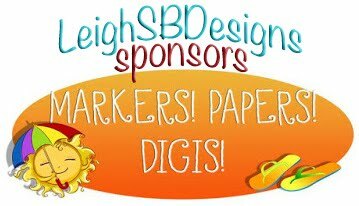 Thanks for sharing with us at Aud Sentiments! 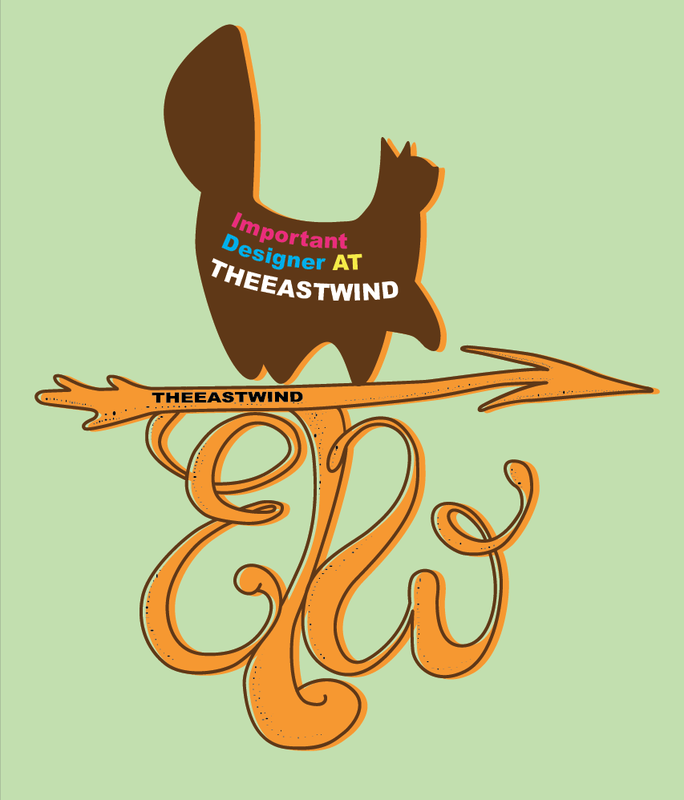 Thanks for joining our challenge Oldie But A Goodie with this great entry, good luck. 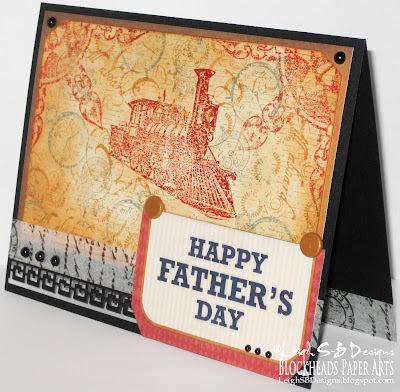 I just love this grungy card and the whole look, really cool! 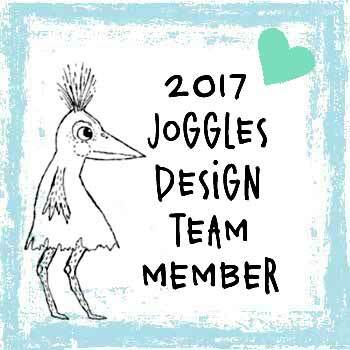 Thank you so much for joining the Delightful Challenge Team this week! 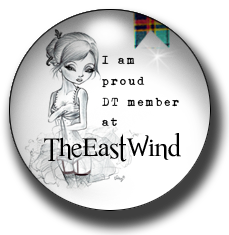 fabulous card and thanks for the step by step. 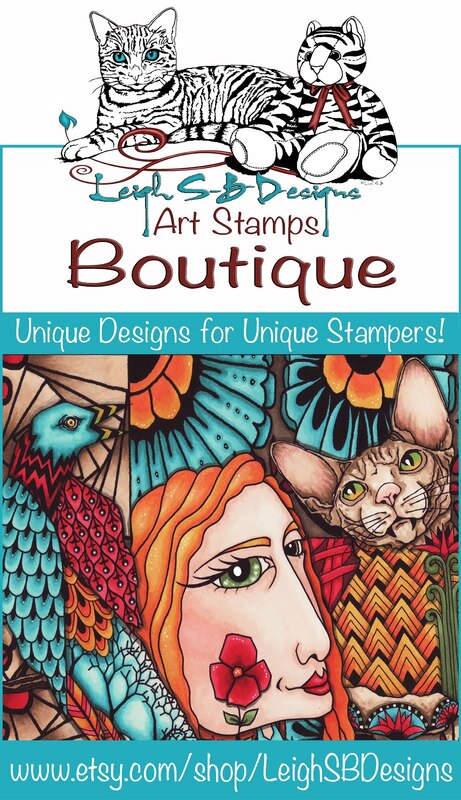 I love the background and the stamp is perfect. 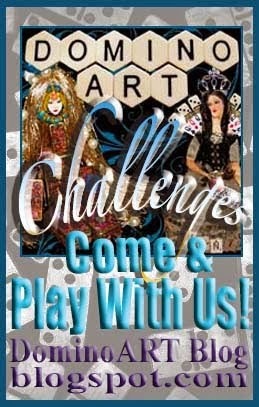 Thanks for sharing at Delightful Challenges. 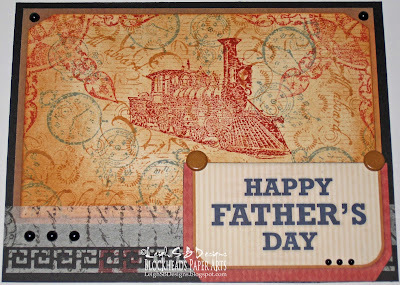 Love your dad day grungy card!